While Facebook Messenger keeps you in touch with your family and friends on Facebook, some features of this service may be activated or deactivated based on your personal preferences. Your configuration settings will differ between a computer or a mobile device. Facebook chat options can be accessed on a computer by clicking the Messages icon at the top right side of the screen, and then clicking See All at the very bottom of the list. Clicking "See All" will result in a screen appearing with a full view of your latest conversation, and a list of prior conversations in a list on the left-hand side. There are many options available to manage your messages, here we'll take a look at a few of the most helpful. View Photos in Thread: This is a helpful option if you are searching for a photo that was previously posted in a conversation, or if you'd simply like to look at all photos that have been posted in a chat. This option eliminates text messages and shows only the images posted in the chat. Mute Conversation: This option allows you to suppress notifications from a specific conversation temporarily. Selecting this option will bring up a screen on which you can choose how long you'd like to mute the conversation: for one hour, until 8 a.m. the next day, or until you un-mute the chat. Delete Conversation: This option enables you to delete specific messages from a conversation -- which may be helpful if you'd like to keep the most important parts of the conversation for future reference. Note that the options in this list pertain only to the chat you are currently viewing. Options must be changed on a chat-by-chat basis — one change will not apply to all chats. Chat-management options on a mobile device are more limited than what you'll experience in a browser. 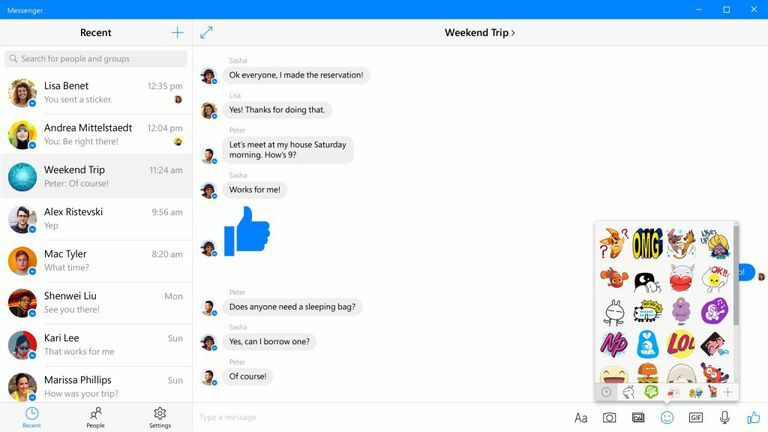 Open Messenger and tap the conversation that you want to manage to open it. Then tap Manage at the top right of the screen. Mute Notifications: Tapping this option mutes notifications generated by activity within a chat. To un-mute, tap Manage again and then tap Un-mute notifications. Leave Feedback: This option leaves feedback to Facebook regarding how satisfied you are with the Messenger product. This option is not helpful for managing your messages. Manage Messages: This option allows you to do two things: block sponsored messages (in other words, ads sent by Facebook through Messenger) and "Block Messages," which results in the blocking of all messages sent by the party in the chat which you are managing. Both of these options are activated by toggling the switch. Having Problems With Facebook Chat? How Do You Block People on Facebook Chat?